Colin Meloy is the lead singer of The Decemberists, an indie rock band from Portland, Oregon who won me over with Hazards of Love, a rock opera filled with maidens, fawns, forests, rakes, and drama. That’s the band’s style, epic concept albums that are part great hall feast and part rock&roll, so if that’s something that sounds cool and you haven’t come across them before, you’re welcome. 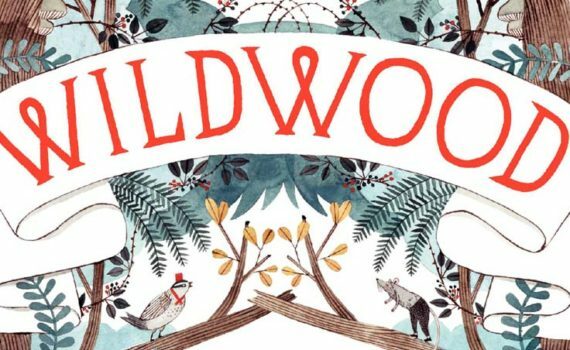 Anyway, Meloy also writes children’s fantasy in his spare time, pumping out a hefty trilogy of Wildwood books because, you know, some people are annoyingly talented like that. His books are as weird and wonderful as his music, filled with challenging vocabulary, grand themes, and colorful characters. What more could you ask for, in story or in song. One gray day in Portland, Prue is out for a bike ride to the park with her much-younger baby brother Mac, when a murder of crows swoops down, picks the tot up, and flies away with him into the Impassable Wilderness, a dense forest just outside the city. Prue, completely shocked, goes after him, picking up a straggler along the way; her classmate Curtis, not exactly a friend, but a kid who is ready to help someone out, no matter the danger. When the pair penetrate the wood, they soon discover that there’s another world hidden inside, kept safe from the Outsiders by a powerful spell. How Prue & Curtis got in is a mystery, and what the complicated ex-Governess of South Wood Alexandra wants with Mac is a dark secret that will spark a war within the Wilderness. I had to pause to pronounce words, I had to look things up, I had to read with care, and this is while telling the story aloud to my kids, not something that happens often when reading children’s literature, but also something that was refreshingly challenging. Meloy has a talent for words and stories, there’s no doubt about that, and he shows it here like he shows it with his band. Prue’s tale is really an awesome one, something that you can’t stop reading, as she is a character that you can’t help but root for. What a great imaginary world, this secondary existence just outside our own, this whole other universe of magic and battle that we’re lucky we don’t slip into. I’m ready to read the next two books if they are anywhere near as good as this one, and I have no doubt that they will be.